University of Santo Tomas, the Philippine’s oldest university, is beautiful. I may be a proud Atenean but there’s no denying this fact. It’s got a different charm, the kind of charm only a historical institution like UST can ever possess. It’s actually already my third time to visit this campus. Although the first one doesn’t really count because I was just a baby then. (My mom gave birth to me here at the UST Hospital. #FunFact) The second time was when I took the UST college entrance exams so I wasn’t really able to wander around the campus. And finally, the third time was for Freshgear’s Fashion Face-off which happened just last August 14. This was the first time I was able to see more of the campus and even got to interact with so many Thomasians. Boy, did I get a warm welcome! Thank you to all of the sweet Thomasians who dropped by the Freshgear booth! To the Thomasians who were part of the program, I hope you had fun because I sure did! I got such a high from you guys that I’m even more excited to visit the next campuses lined up for Freshgear’s Fashion Face-off. Yes, I’m looking at you, San Beda! See you this Thursday for another round of fierce face-offs. I will be joined by the Enciso sisters for this round so I hope you bring your A game! I wonder if I can take pretty outfit shots there too? Once again, make sure you follow FreshGearJeans on Facebook, Twitter and Instagram for live updates of the face-off. I love it! Omg, how i wish im still a student right now! Coz im proud Thomasian,in here!!! I can relate to you, since my mom and dad use to bring us there in USTE Hospital, and that was our second home when we still leaving in manila. Was bothered when I saw you in the Arch of the centuries! :( =)) Hope you could visit UST again! you look beautiful. :) sana you could visit Naga City. :) btw, ate Cams how many celine bag do you have po? Hello Maebs! Surely! I steal my mom’s haha! So counting hers plus mine, 10? Omgggg!!! You’re an Atenean too??? well, ME TOO!!!! :))) haha I currently studying at Xavier University High School ateneo de cagayan right nowb:)) I love your look so fresh!!!! Love the pants and necklace! Oh no~ what is it? So pretty po talaga… Hope you could visit here in Davao. Maganda rin alma matter ko. University of Southeastern Philippines. Marami din po magagandang spots dito..hehe. And you could meet with your fans. ^_^..
She is so beautiful and also the dress is so gorgeous. Beautiful photos! Love the outfit. I was thinking the same thing (about UST) during my visit there last weekend (proud Thomasian here). You should visit on a Sunday or a holiday, when it’s not so crowded. It’s exudes even more charm, at least to me. I can tell you love those Alexander Wang heels – you’ve been abusing them the past two weeks (and the black pair as well)! You’re tempting me to get a pair myself (I’m looking at them online as I type this, haha). Remember that ribbon-y blouse you designed for Romwe? Wore it during my vacation in Europe last month. Loved it so much it was one of the first items I packed in my luggage. You must get them! We all got them on sale haha! :) Thank you Krissy! I’m glad you brought my top with you! Yay! I love your blue color palette for today :) You look so beautiful (as usual). I’m loving the print on your pants <3 UST is indeed a very beautiful school and it's actually my dream school here in the Philippines (I'm still proud to be a Bedan though). LOL! It will never be the prize for any of my giveaways haha! :) Thank you Kyle! Yeah! It looks very European :) At least you got to take a peek! You look gorgeous Camille! The pants have a gorgeous print and the tiny bag is so cute and adorable! :D Great outift, clean and chic! I loved blouse with necklace and color in harmony with denim pants and other accessories . I like floral . The creative design in heels that surprise me . I’m simply stunned by the simplicity of this outfit. Even though these are just some patterned trousers and a pastel blue blouse, they look awesome. The cut is quite refined and the design is also different: a 3/4 skinny jeans. On the other hand, the blouse is quite loose, resembles a crop top but still has this casual touch. I’m absolutely in love with that outfit! I will never forget this day haha so happy I scored a selfie with you. It was nice seeing you, Ate Camille. Thanks Kristie! Nice seeing you too! Love the look. Gorgeous pants. 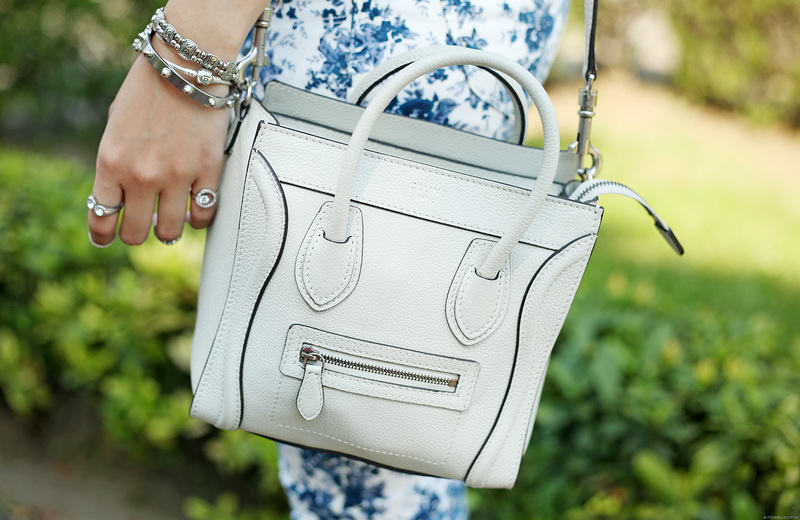 Love this outfit and I will FOREVER be in love with that White Celine Nano. Camille diba you only have one version of this Celine bag: http://www.celine.com/en/collection/winter/leather-goods/9 BUY mo na yaaan para dalawa na! haha! Thanks Tasha! Masaya na ako with my box bag haha! Next time! Love those jeans Cams! Super chic. 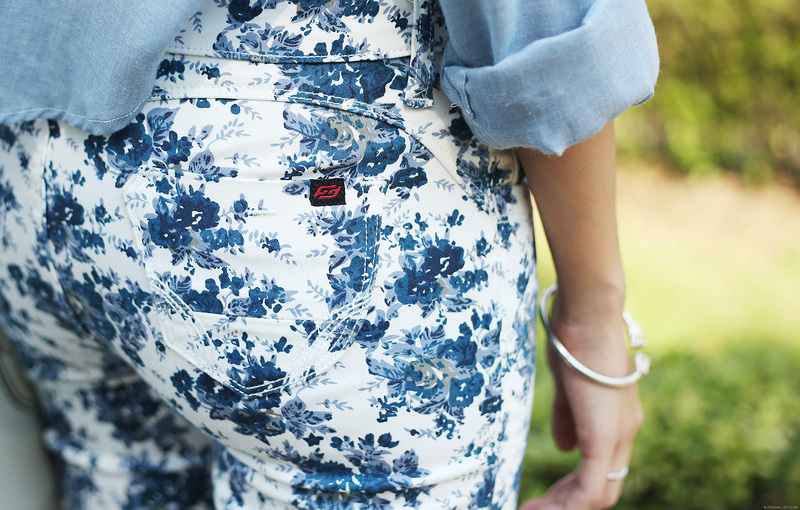 Floral prints are one of my faves and well so is blue! The blurred guys at the background of your last photo though. I think they’re checking you out or something. Oh well Photobomb moment. LOL. PS: I love your eye make up too! I can see that you’re really a proud atenean with that shades of blue haha. You look so beautiful.